How To Become A Proofreader. It's A Lot Easier Than You Might Think. Contrary to popular belief, you don’t have to participate in an expensive correspondence course and acquire an ‘official’ qualification to become a proofreader. In fact, there are no official proofreading qualifications and the correspondence course method offers extremely poor value for money. To find out why many proofreading courses offer little value for money and why proofreading qualifications are of practically zero use, click here. To find out what you do need to become a proofreader, read on. How to become a proofreader, step one. First of all you need the aptitude to proofread. This is something you’re pretty much born with. You need attention to detail. You need an inquiring mind. You need patience. You need to be thorough and methodical. Of course the ability to spell and a sound grasp of grammar are really important, but we have dictionaries and spell checkers and books like Fowler’s Modern English Usage to help us out in these matters. What I refer to as ‘the proofreader mindset’ is an absolute essential. How to become a proofreader, step two. You’ll need to funnel your ‘proofreader mindset’ through a robust and effective proofreading methodology. You’ll find such a methodology between the covers of The No-Nonsense Proofreading Course. I can’t stress enough how important this is. You could be the most literate and eagle-eyed person in the world, but without a powerful proofreading methodology, I guarantee you will miss even the most elementary of errors. How to become a proofreader, step three. You will need to gather some experience, enough to be able to say, “I’m a proofreader.” This doesn’t have to be a great deal, and The No-Nonsense Proofreading Course tells you where you can get this resume-boosting experience gratis. With proofreading, a little of the right kind of proofreading can go a long way. How to become a proofreader, step four. Most employers will not ask you for proofreading qualifications. In fact, I would be very surprised if any asked for proofreading qualifications. What they are far more likely to do is look at your experience (that’s your foot in the door, as it were) and then ask you to take a proofreading test. With your proofreader mindset (courtesy of your genes and upbringing) and your proofreading methodology (courtesy of The No-Nonsense Proofreading Course), taking a proofreading test will be a cinch! How to become a proofreader, step five. And you’re in! Well, it probably isn’t going to be that simple. With all jobs, particularly when you’re looking at a change of career, there are bound to be setbacks and knock-backs. Persistence is key. Spending as much as $750 (compared to just $48.99 for my eBook) on a proofreading course that promises an ‘official’ proofreading qualification is not going to advance your cause any further. And it will leave a significant dent in your bank balance! 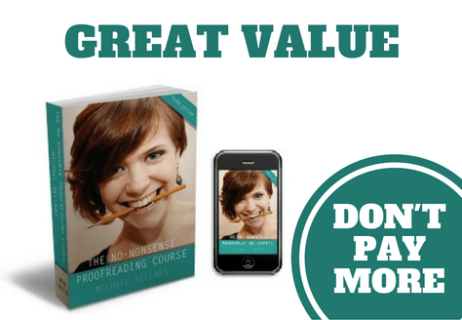 The No-Nonsense Proofreading Course guarantees you will be able to confidently pursue professional proofreading opportunities or your money back! If, after reading the eBook and taking the steps laid out within its covers, you don’t feel as if you’ve taken your first real steps on the road to becoming a professional proofreader, just let me know within 30 days of purchase and I will give you a full refund. No questions. No quibbles.